For the whole month of October, get to experience a sumptuous Sustainable Seafood and Wine Pairing dinner treat for less than Php3,000. You'll definitely dine with heart at 22 Prime of Discovery Suite as it now offers an elaborate Sustainable Seafood Menu featuring artisanal fishing seafood products, in partnership with Meliomar Sustainable Seafood Solutions. 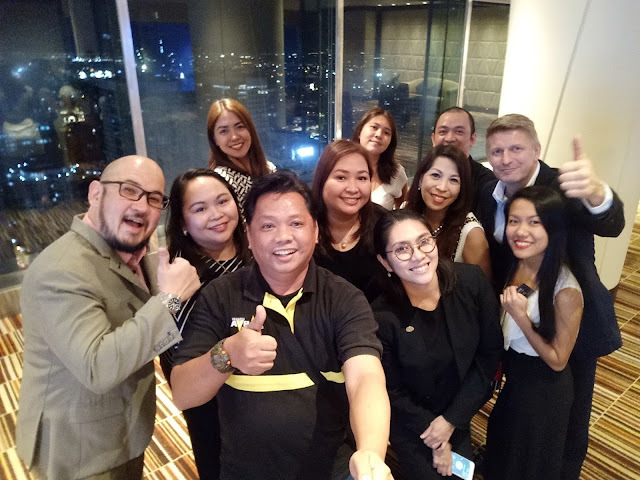 At a media launch held just a few days before the month of October, selected members of the media, together with the peeps from Discovery Suites and their partner brands, were invited to try their proud dinner offering. I have to say that the night was not only filling but tasty as well for both meals and wine servings. Add the ambiance of the 42nd floor which is the highest point of Discovery Suite, you'll feel the elegance rarely experienced by the average person. At an amount justifiable as a reward for a good day's work, you'll never think twice of coming to dine on this fabulous treat. 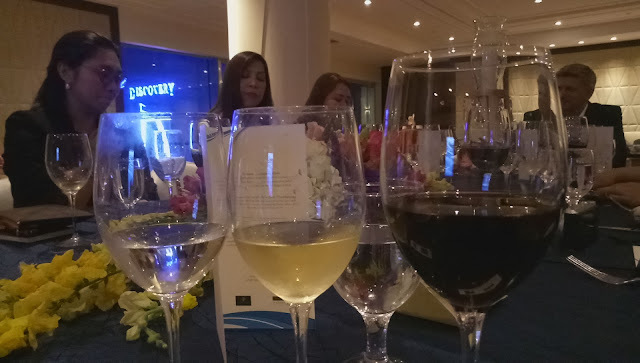 The four-course dinner was worth the traffic congestion afterwards as the taste of both wine and seafood still lingered making it a very memorable night of gastronomic delight. We have to thank the chef for such a magnificent dinner, and the three kinds of wine as your choices to be paired with every dish except the dessert. 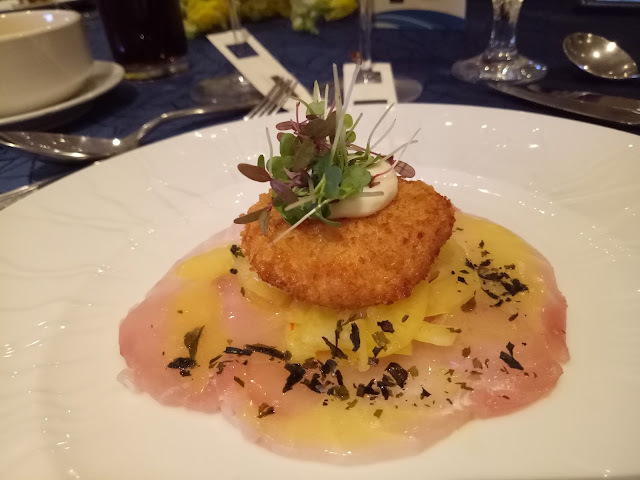 I must admit I was already anticipation of the next dish after tasting the fresh Mackerel Fish Carpaccio and Spanner Crab Fritters with Compressed Fennel Salad, Micro Greens, and Seaweed Pepper. All parts of the dish offer distinctively unique tastes which prompts you to also try them out individually or in combination. Second dish served was the Seafood Volute with Saffron Foam served Parmesan Herbs. Now this soupy dish has mutually complementing solid and liquid ingredients that you'll want to come back to have more. 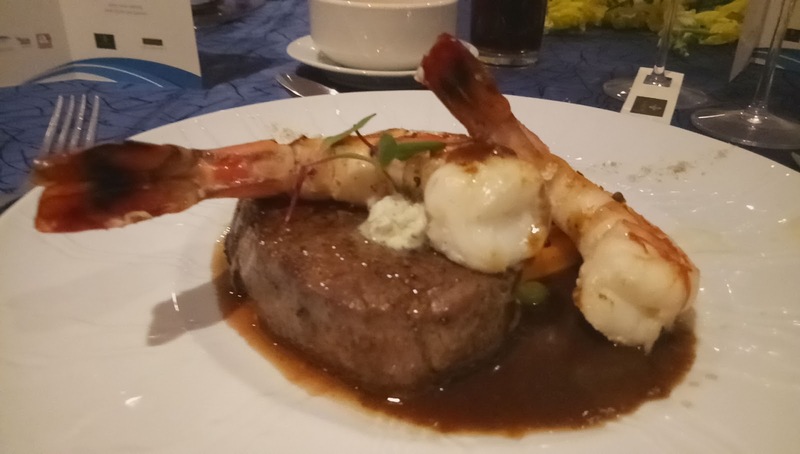 The main course is a succulent Surf and Turf, Sous Vide Fillet Mignon and Grilled Selva Prawns, with Cauliflower Puree, Baby Carrots, and Mushroom Dust, served with Truffle and Garlic Compound. You'll be amazed with the size of the two pieces of prawn. One would already fill you up but they have two to further satisfy you. But wait there's more so make room for the meat that's perfectly cooked as tender and juicy just the way we like it. 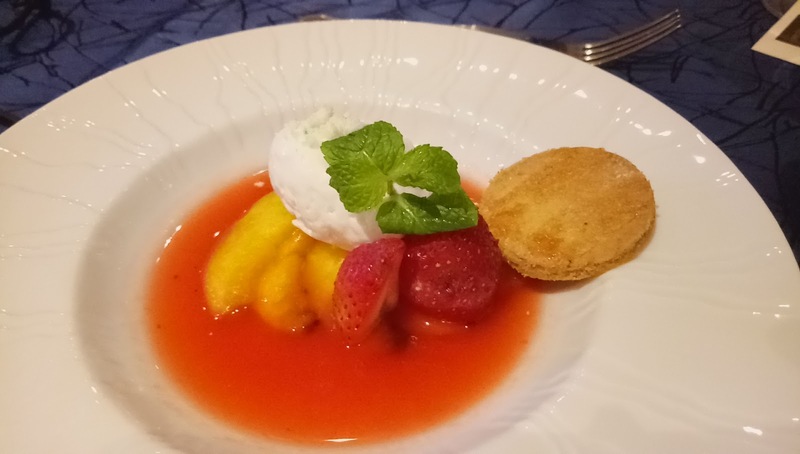 Head on to dessert with a delightful Fresh Strawberry Soup with Grilled Peaches and White Chocolate Mousse. Of course, all great meals must end with a great dessert. It is not very often that I get to experience sweet endings that has soup combined with Chocolate Mousse and my favorite fruits like peaches and strawberry. 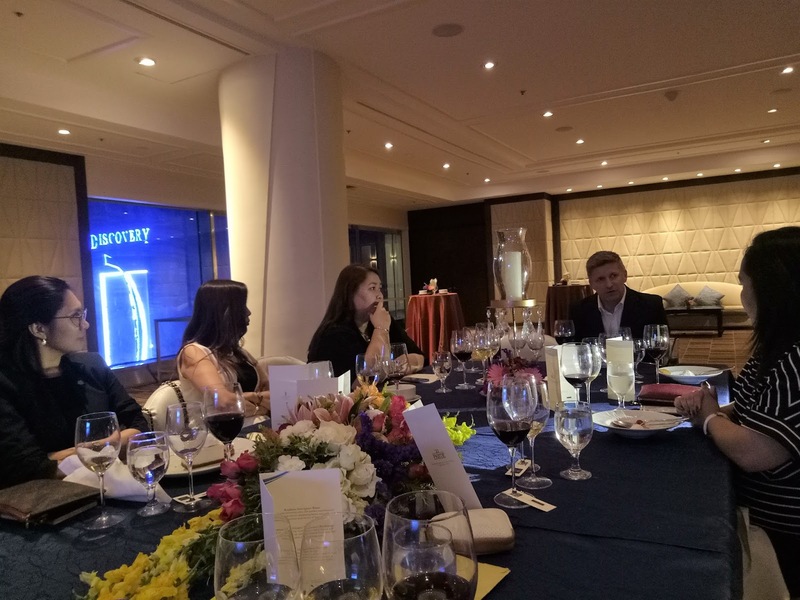 The special line-up is paired with a choice of Renmano Chairman’s Selection Cabernet Sauvignon or Chardonnay, or Anakena Sauvignon Blanc distributed exclusively to hotels of Futuretrade. Thank you Discovery Suite for inviting us at your special intimate event. I feel honored being part of it. Sustainable Seafood The Discovery Leisure Company envisions that all menus across their hotels and resorts will serve only seafood sourced from sustainable fishing by 2020. An effort to address seafood depletion and artificial seafood cultivation, artisanal fishing involves small scale fisheries that perform natural breeding and traditional fishing techniques, having low impact on aquatic habitats and high catch selectivity. Hence, not only is the aquatic environment preserved, but also are the seafood products organic and fresh. This Sustainable Seafood Specials and Wine Pairing promotion runs October 1 until October 30, 2017. 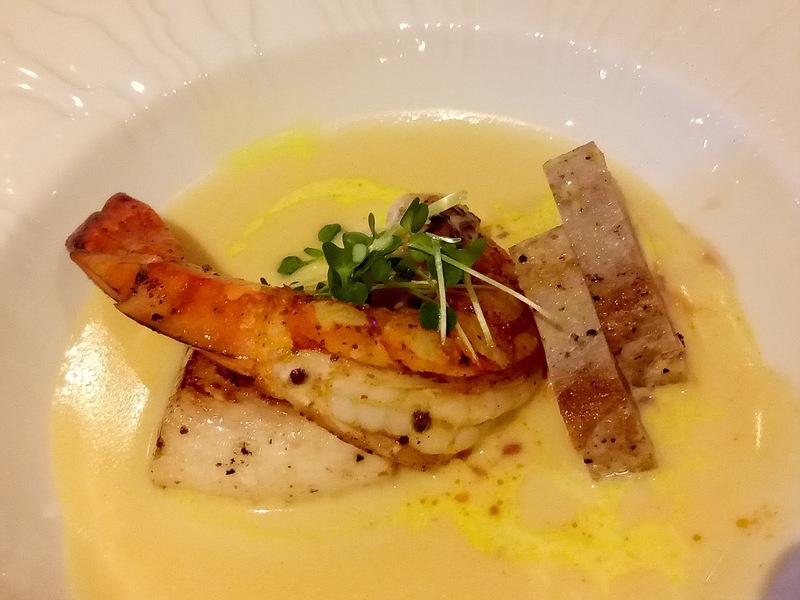 Delight in these sumptuous seafood specials while supporting a good cause for the country’s aquatic environments and noble fishermen.